I came across this recipe for Chilean Rice, although I'm not exactly sure what makes it "Chilean." Regardless, it was a tasty and colorful addition to our Chilean wine & dine event. Besides, rice pretty much goes with everything in my book! Rinse rice several times under cold water in a sieve and drain. Cook the onion, bell pepper, and carrot in lard for 2 minutes. Add the rice and cook another minute, allowing rice to get thoroughly coated with lard. Add the hot broth, and salt and bring to a boil. Reduce heat, cover and simmer for 15-20 minutes on low heat, until liquid is absorbed and rice is tender (do not stir while cooking). 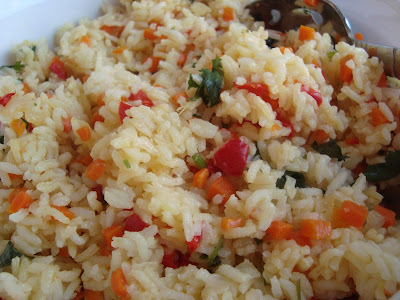 Fluff rice with a fork and garnish with chopped cilantro. Serve hot.